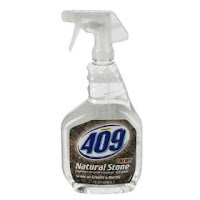 Word on the street (aka my cousins Debra and Laura), Formula 409 Natural Stone Cleaner is the hottest new cleaning product. I have been using a very mild soap on mine and have not been so in love with the results. “They” say this stuff is awesome – cleans well with no streaks. Apparently, it is very difficult to find in stores. It sounds like my cousins have been hoarding it!